Even though the kids are older, I may still just buy this – lullaby versions of Nick Cave & the Bad Seeds classics – and a good selection as well. The idea of a lullaby version the of the Mercy Seat is intriguing. 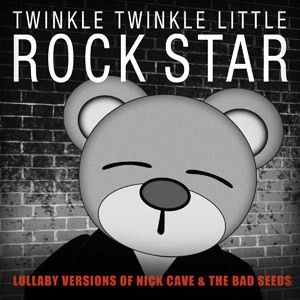 Lullaby Versions of Nick Cave & the Bad Seeds is the newest title in the Twinkle Twinkle Little Rock Star series, produced by The Roma Music Group. 11. Are You The One That I’ve Been Waiting For? Folks, this compilation is a wonder and a delight. With its high-quality instrumentation, this album ain’t just for babies. Immediate favorites: “Straight to You”, “Are You The One That I’ve Been Waiting For”, and the ethereal “Push The Sky Away”. The most surprising inclusion is the gently sonorous, “Dig, Lazarus, Dig!!!”. Wonderful stuff. Appropriate for listening at work, on your way to class, while meditating, preparing dinner, to clear your mind after an über krap day, or any time you want to bring a little sunshine into your head. When I go to bed tonight, my ear buds will be twinkling with Lullaby Versions of Nick Cave & The Bad Seeds. TWINKLE TWINKLE LITTLE ROCK STAR: If you don’t know about this miraculous company, and the astounding number of artists and genres featured in their catalog, do yourself a favor. Check out their website. TTLRS produce lullabies for all ages. And people, they take requests. All titles are available in CD on demand or clean and green digital versions. via Review: Lullaby Versions of Nick Cave & The Bad Seeds | Nick Cave Fixes.